Before much was known about psychedelic drugs, they were used as medicine. There are a lot of rumors and propaganda about psychedelics. Some people say that they are perfectly safe and others say that they are dangerous drugs. With all the information about psychedelics out there it is difficult to sift through what is true and what is not. There are some amazing facts about psychedelics that most people do not realize are true. Many people do not know that many psychedelic drugs including LSD, MDMA, and Mushrooms, were once used for treatment of a variety of psychiatric disorders. In some cases these drugs are still being researched for psychiatric applications. When psychedelic drugs were in their infancy not much was known about them. Psychologists and psychiatrists used them to induce relaxed suggestive states in their patients. In many cases this treatment worked at least temporarily. It is surprising that many of these drugs are not considered addictive physically. It is difficult to think that these powerful drugs do not make many permanent changes in the brain and body. According to the National Institute on Drug Abuse, most psychedelics are not physically addictive. This is not to say that they are not at all psychologically addictive. MDMA has been used in the past to treat PTSD. Some people can use psychedelics for years and not have any issues with addiction. Others become psychologically addicted even after a few uses. This psychological addiction is indicative of other psychological problems and not necessarily the psychedelic drugs. In the 1970s, psychiatrists often used MDMA to treat depression and anxiety with a great deal of success. Unfortunately, when people who did not need treatment started using it as a recreational drug, the government outlawed its use. It is still being researched as a psychiatric treatment and shows successful results in many patients. Scientists are currently researching psychedelics for medical use. These clinical trials are going on at hospitals and universities. They are trying to find useful applications for some of the more beneficial properties to these drugs. There is a popular misconception that psychedelic drugs cause psychosis. This is not necessarily true. According to research, psychedelics only produce serious psychological ill effects when a person already has a psychotic disorder. It is possible for them to cause a latent disorder to become apparent but they themselves do not cause psychosis. This is contrary to many of the media propaganda produced when these drugs were first made illegal. These facts are not to say that psychedelics are not dangerous. There are some severe mental and physical side effects to many of the psychedelic drugs. 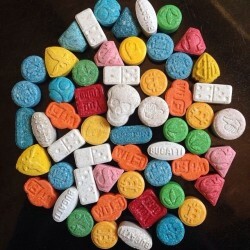 Also with new and synthetic psychedelics coming on the market as well as dealers and manufacturers mixing other substances with them, they even more dangerous than ever before. According to the National Institute on Drug Abuse, some of the psychedelics can produce lasting flashbacks and withdrawal symptoms. For more about psychedelic drugs give us a call at 1-800-895-1695. Are Hallucinogens Addictive When Used Every Now and Then? - Although most hallucinogens don't cause addiction, there are some exceptions and other negative side effects of abusing these drugs. Are Psychedelic Drugs Addictive? - Most psychedelics are not actually addictive, although PCP is. It is possible to grow a tolerance to LSD, but the addiction potential is not too high. Avoiding Relapse after Psychedelic Addiction Treatment - Keeping busy with healthy activities after treatment is the best way to avoid relapse and succeed in your recovery efforts. Avoiding the top 10 Psychedelic Drug Addiction Treatment Mistakes - For a successful recovery, be sure to avoid the following psychedelic addiction treatment mistakes. Can PCP Addiction Be Treated? - PCP is highly addictive and difficult to quit. Learn about PCP abuse and treatment options here.